A few weeks ago on a Saturday I left my house without my wife and without my kids. It was a moment to celebrate as it was my first night out with a couple friends since my boys were born--never mind that my "night" lasted from about 5:00 in the afternoon until 8:00 in the evening, when after eight tacos and two Victorias I was thoroughly and utterly spent. But this post isn't about my exciting night life, but rather--as is often the case on my blog (and life)-- it is about a taco. Thanks to Lori Midson, the versatile and talented Westword food-writer who also happens to share a passion for great tacos (and know her way around some of Denver's finer taco spots), our first stop that night was Guadalajara Authentic Mexican Buffet. Located in a complex on East Colfax that also includes the Fruteria Guadalajara and the Panaderia el Molino (both worth a stop), the buffet, as implied in the name, is the main attraction here and indeed looked enormous and enticing. 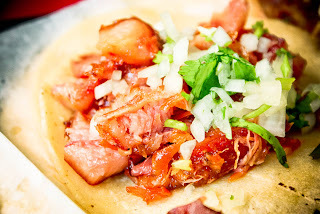 I made a mental note to return in the future to sample its plenitude, but then made my way to the back where they were slinging a taco that Lori Midson pegged as one of Denver's 100 best dishes for 2011: the pig snout taco. I have sampled a lot of parts of the pig in taco form. When I first would visit the woman who would later become my wife in her native Mexico City, one of her favorite pastimes was to take me to markets like the Mercado de Tlacoquemecatl and feed me taco after taco of unidentifiable pig (and cow) parts. In Mexico, like many other parts of the world not in the United States, the "head-to-tail" philosophy is not a growing trend, but rather an old tradition and way of life. In these trips we ate literally everything from head to tail, or in our case ojo (eye) to nana (uterus). Imagine if you will the iconic image of a young couple sharing their first milkshake: straws crossing and lips meeting for the first time-- replace the milkshake with a half-dozen tacos of unidentifiable offal and you get a snapshot of our courtship. Now you can see why I fell head over heals--literally-- over tacos de cabeza and tostadas de pata. The taco counter in the back of the Guadalajara Authentic Mexican Buffet sells meat by the kilo but will also make you individual tacos from whatever they have. We ordered a variety that included carnitas, pastor, buche and of course, trompa. The pastor did not come from a spit as far as I can tell and as was to be expected was forgettable. It wasn't bad but was more like adobada than pastor. The carnitas on the other hand were divine. I just had a bite of one, but agreed with my tablemates that they were some of the finest carnitas I have had in Denver: moist and rich with flavor. Finally what we had come here for: the pig's snout taco. Indeed as advertised by Lori Midson it was an amazing taco. The snout, or trompa, had a texture like that of slowly braised pork belly. The taste was salty--but not too salty-- and smoky almost like Canadian bacon but with extra bits of fat. It was a fantastic taco. With our tacos we had a round of Victorias. My first taste of Victoria in the US. While every other beer from Mexico's two mega-breweries has always been imported into the US, Victoria's slogan has always been "Es Nuestra", or "It's ours". I guess it is a sign of the times that Victoria is finally being sold in the US-- and as the Mexican population continues to boom, "Es Nuestra" takes on a whole new meaning stateside (Think George Lopez instead of George Clinton singing: "Gainin' on ya!" ). 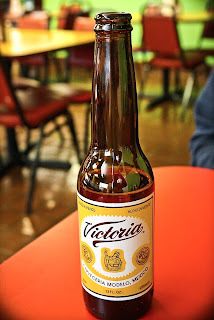 I have to admit, however, that although I have always said Victoria is my first choice of the many Mexican lagers, it somehow tasted not-quite-as-good knowing that it is now available in the States. It's funny how that works sometimes. I'm not sure where I would put this taco de trompa on my list of top 100 favorite foods as I get confused counting once I run out of fingers and toes. That being said, it is one of the better tacos I have had in Denver and I will now make it a regular stop on my Aurora circuit-- a list that is growing longer and longer.